Giovanni Battista Pergolesi (or Pergolese) (1710-1736) was born in Jesi, near Ancona, Italy. The original name of the family appears to have been Draghi but, according to custom, those members that settled at Jesi were known as Pergolesi or Pergola, a town of which they were natives. He signed his name both as Pergolese and as Pergolesi. He studied music there under a local musician, Francesco Santini, before going to Naples where he studied under Gaetano Greco (c.1657- c.1728) and Francesco Feo (1691-1761). He spent most of his short life working for aristocratic patrons like the Prince of Stigliano and the Duke of Maddaloni. Pergolesi was one of the most important early composers of opera buffa (comic opera). 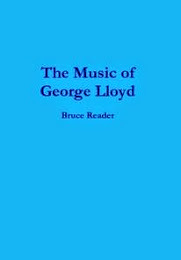 He also wrote sacred music, including a Mass in F and his Magnificat in C major and instrumental music, including a violin sonata and a violin concerto. It is his Stabat Mater (1736), however, which is his best known sacred work. Pergolesi died at the age of 26 in Pozzuoli, apparently from tuberculosis. 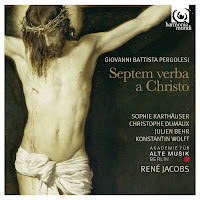 Whilst there are many recordings of Pergolesi’s Stabat Mater, many of his other works are less well known. In the case of his Septem verba a Christo (Seven words from Christ) it wasn’t until 1936 that, following the discovery by Bertha Antonia Wallner of a complete set of manuscript parts made in the monastery of Metten in 1760, that it was discovered that the work must be, as it indicated on the flyleaf, an early work by Sig. Pergolese attributed to Pergolesi. Yet still no edition was produced. In the absence of an original manuscript in Pegolesi’s hand, it was not until 2009, when Reinhard Fehling discovered anonymous performing materials at Kremsmünster Abbey in Lower Austria, that a direct connection with the origins of the work could be established. After the assembling of all the manuscripts, extensive comparisons were made that tend to corroborate the works authenticity. Septem verba is now published by Breitkopf and Härtel www.breitkopf.com . Verbum I: Pater, dimitte illis: non enim sciunt qui facium (Father, forgive them, for they know not what they do). In the recitativo Huc, o delecti filii (Come hither my dear sons) and aria En doceo diligere (Behold, I teach you to love), Konstantin Wolff (bass) has a lovely rich yet extremely flexible voice, bringing just the right amount of emotion to the text. René Jacobs and his excellent instrumental ensemble point up the phrases beautifully. Christophe Dumaux (countertenor) (the soul) joins for the aria Quod iubes, magne Domine (What you command, almighty Lord). He has a rich voice with just sufficient vibrato to add texture. This is a lovely aria, beautifully sung. Verbum II: Amen dico tibi: hodie mecum eris in Paradiso (Verily I say unto thee, Today thou shalt be with me in paradise). Julien Behr (tenor) joins for the one occasion that he takes the part of Jesus in the recitative Venite, currite (Come, hurry) and aria Latronem hunc aspicite. (Behold this thief). Behr’s voice is just right in this music, controlled, full voiced and flexible. He brings a really Italian sound to the music. Sophie Karthäuser (soprano) has a lovely voice as she sings the aria Ah! Peccatoris supplicis, (Ah, Lord, remember the sinner who entreats you) bringing passion and feeling in her ardent singing. Again Konstantin Wolff (bass) shows terrific control, depth and feeling in the recitativo Quo me, amore? (Where, Love) and the aria Dilecta Genitrix (Beloved Mother) bringing so much to the text. Sophie Karthäuser provides some lovely, long drawn, vocal lines in the recitativo Servator optime (O, matchless Saviour) and in Quod iubes, Domine (What you command, Lord) such flexibility in this lovely aria. The Akademie Für Alte Musik, and, in particular the horns, make a lovely contribution to this aria. As the music slows in the central section, there is such deep pathos in this beautiful piece. The instrumentalists bring a feeling of uncertainly as Konstantin Wolff sings the aria Huc oculos, (Turn hither, your eyes) the tension building at the words Dolentum contemplamini (Look upon one who suffers). There is a lovely opening from the lute before the other instrumentalists join and Christophe Dumaux (countertenor) sings the aria Afflicte, derelicte, dum Jesu (O Afflicted, O forsaken Jesus) so full of emotion. Verbum V: Sitio (I thirst). The aria O vos omnes, qui transitis (All you that pass by) is so well written in the way it illuminates the text. Konstantin Wolff reflects this very much in his singing, with some lovely touches from Akademie Für Alte Musik. Non nectar, non vinum, non undas (It is not for nectar, wine or water) brings the return of tenor Julien Behr in this faster aria to which he brings just the right amount of forward drive, beautifully controlled with some terrific singing at the word Celerrime (Most swiftly). Verbum VI: Consummatum est (It is finished). At the words It is finished Konstantin Wolff shows so much bereft feeling as does he in the aria Huc advolate, mortales (Hasten hither, mortals) The aria Sic consummasti omnia (thus you have accomplished all) brings more optimism until a sudden point of anguish at the words Sed heu (But alas) when Sophie Karthäuser shows how to bring such feeling to the words. Verbum VII: Pater, in manus tuas commendo spritum meum (Father, into thy hands I commend my spirit). Konstantin Wolff brings a really intimate sound to the recitativo Quotquot coram cruce statis (All of you who stand at the foot of the cross) beautifully supported by the instrumentalists. In the aria In tuum, Pater, gremium (Into your bosom, O Father) the horns of the Akademie Für Alte Musik sound through as the bass sings Into your bosom, O Father.’ Julien Behr sings the final aria Quid ultra peto vivere (Why should I seek to live any longer) providing a lovely contrast between the varying tempi before the final cantata ends quietly. This important new release is to be welcomed enthusiastically. It is exceptionally well recorded and has first rate notes by René Jacobs. There are notes from the publisher, Breitkopf and Härtel, giving the history of the discovery and attribution of the work as well as full texts and translations.